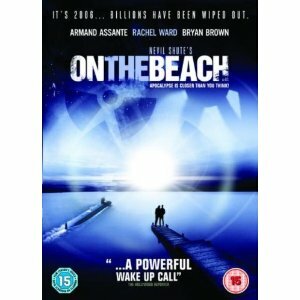 Film Review: On the Beach (2000) – I Love Disaster Movies! Australia has come up with some really interesting disaster movies although the country doesn’t tend to stray into the genre too often. On the Beach is based on the novel by Neil Shute and although it has already been adapted once before in 1959 (although I’ve not seen that yet, its on my wishlist! ), this monster epic film is a real slow burning emotional rollercoaster ride as the film slowly descends downwards and downwards unto its heart wrenching end as the results post nuclear war slowly move towards Australia to effectively end the world. The film follows five main people and how they deal with the coming of the end of the world following a nuclear war. As all hope slowly fades away everyone is forced to deal with their ultimate demise. Not an uplifting film then…! Nuclear weapons, the fallout and the radiation sickness that the weather brings in to polish everyone else off. This film is an epic 3 hours and 20 minutes long! The nuclear blast, although it happens off screen, happens in the opening credits. From there we are introduced to our American submarine crew led by Armand Assante who are marooned and have nowhere but Australia left to go. It’s there he meets the four other main characters, Navy Husband Peter (the fantastic Grant Bowler) and Wife Mary (the fragile Jacqueline McKenzie), Mary’s sister Moria (the colourful Rachel Ward) and scientist Julian (Bryan Brown who actually acts really well too even if you think he mind burst into a comedy moment sometimes). The first hour or so sets up a mission where they think they may have found survivors in Alaska and so the sub sets off with all three main men aboard to see if there’s hope for mankind. Sadly there’s not and by the time they all return its just in time for everyone to make their peace and say goodbye. Of course there’s a lot of sub characters who all add in their own pieces and this is one of those films where I don’t really want to go into plot specifics a great deal as its more about emotions and the slow layers that are built over the first hour and half which then make the second half of the film so much more powerful. It’s absolute testament that a 200 minute film is able to sustain your interest in one sitting. In what is a TV movie (which you can always tell by the cheap credit sequences they all have), the director and sets are all fantastic given the budget they probably had. It never once feels cheap. The acting, especially Bowler, McKenzie and Ward’s is absolutely fantastic and the last 45 minutes are really harrowing to watch. I won’t be ashamed to admit in the final scenes I had tears in my eyes. How often can a TV disaster movie really do that! Effects are quite sparse in the film. The submarine footage actually for the most part looks real. There are long shots of deserted streets which are quite haunting, as are the shots when you look through the periscope at various burnt out cities along the way. The make up actually deserves a special mention too for making everyone look so ill and dead as the radiation takes over the body. On the Beach can potentially make you an emotional wreck! Inspite of probably being a little too long, the time spent with all your major (and some of the minor) characters means that you are so invested in them, it makes the whole anti nuclear message so much more of a hard hitting warning. There’s a specific line that stuck with me afterwards, where the mother and daughter are playing in the garden and Moira says “if there was a picture of that above every launch button, none of this would have happened” and I’d like to think its true. The movie also touches on the politics of countries as well, citing that yes you can blame who pulled the trigger, but where was everyone else in trying to stop countries getting to that state? A big theme that runs through the film too is that of euthanasia. Although it only touches on it, and it could have been really debated a little more, the scenes of massive queues for the little blue pill, followed by the closing segment of the film are so emotive and powerful, it really sends out the ultimate message when you’re choosing to kill your own child to stop their suffering. This is a joint top. Rachel Ward is fantastic as the drunken chain smoking easy to fall in love Moira and every scene she’s in, she lights up the camera. Grant Bowler’s character Peter is such a noble, family loving man, and is played with such integrity and genuine love, it made the entire last section of the film so very difficult to watch. Well everyone dies in the film and best death is really the wrong phrase, perhaps the most powerful death is that of the daughter. Possibly the only jarring parts of the film for me were the occasional flashbacks and “edgy” speeding up of the clouds behind people when something big happens. It just didn’t fit the mood or tone of the rest of the film. The only clever thing was the flashbacks burst in from pure white, which of course is what the blast would have been like. 3 hours is a lot to ask, but if you find the time I recommend investing yourself in this epic disaster drama. It’s very depressing and morbid but with that comes the power and message its conveying with its jaw dropping conclusion. Although, the 1959 version is better, I have to say it was more heart wrenching when the Australian Naval Officer, is euthanyzing his very young daughter, because I am a father myself. I believe the little girl is 4 years old in the movie, and I have a daughter, who is also 4, so I mildly broke down at the part when you hear her coughing (obviously because of the radiation sickness) and he cradles her while crying. That moment really hurt deep down, because in the situation, I don’t know if I’d be strong enough to go through with it. On either of my kids. Both versions of On The Beach are great, but I have to say that the 2000 version’s ending is more gut wrenching as they show the Holmes family lying in bed dying as a family. Thanks for your comment Brian! I’ve yet to see the 1959 version, I’ve bought it and its about 3 movies away from being watched so I look forward to seeing how closely this film mimics it. I agree though, the whole last section with the family was really harrowing to watch. Pingback: 2010 in Review « I Love Disaster Movies!